This is the translation for the above: At the table with good friends and family you do not become old. Nice, eh? I have to apologize. This is my first post since Thursday. It just seemed life conspired against me having the time to post anything since then. Hopefully this one will put me back in good stead. It's a recipe for Bolognese Sauce, a delicious slow cooked meat sauce for wider types of pasta noodles, or even for lasagna. Thick and rich this sauce makes a substantial meal. Because it was cold and dreary, I wanted something a little substantial for dinner recently. The recipe is definitely a weekend recipe, although I would imagine it could be accomplished quite well in a slow cooker. This is the sauce just ready for the slow, long cooking. So pretty much all was already present except for the sausage meat. I know that’s not strictly traditional, but it does add a little more complexity of flavour. I’m not saying traditional bolognese sauce isn’t fantastic. This is more of a case of what I had on hand meeting what I wanted to make. I'm not the only one using what's on hand either. There are many different kinds of meat that find their way into Italian Bolognese. Two bits of advice. First, take care in choosing your sausage. 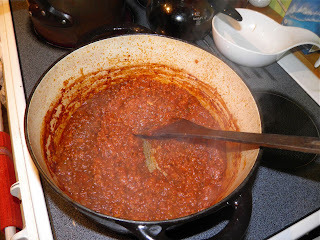 You don't want your Bolognese too spicy/hot or it overpowers the nutmeg which should be the main spice. The second is don’t skip the milk. It’s an important important step in tenderizing the meat. Even though this is cooked for a very long time it does make a difference. It's also a bit of a messy job since it simmers uncovered. I thought had a spatter screen but I couldn't locate it. Next time I'll make sure I have one in hand. The sauce dates back at least to the 5th century. The little tomato paste present in the traditional recipes was added after the discovery of the New World. push the sauce around with the spatula. The traditional recipe, registered in 1982 by the Bolognese delegation of Accademia Italiana della Cucina, confines the ingredients to beef (skirt steak), pancetta, onions, carrot, celery (stalk), tomato paste, meat broth, red dry wine (not bubbling), milk, salt and pepper to taste. 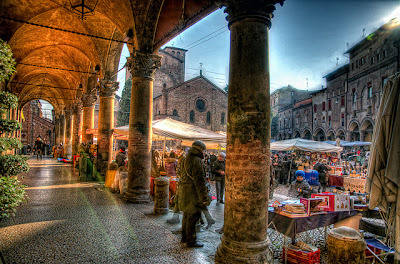 However, many variations using other regional products do exist even in the Bolognese tradition. Some make use of chopped pork or pork sausage; chicken liver may be added along with the beef or veal for special occasions, and today many use both butter and olive oil for cooking the soffritto. * Prosciutto, mortadella, or porcini mushrooms may be added to the ragù to further enrich the sauce. 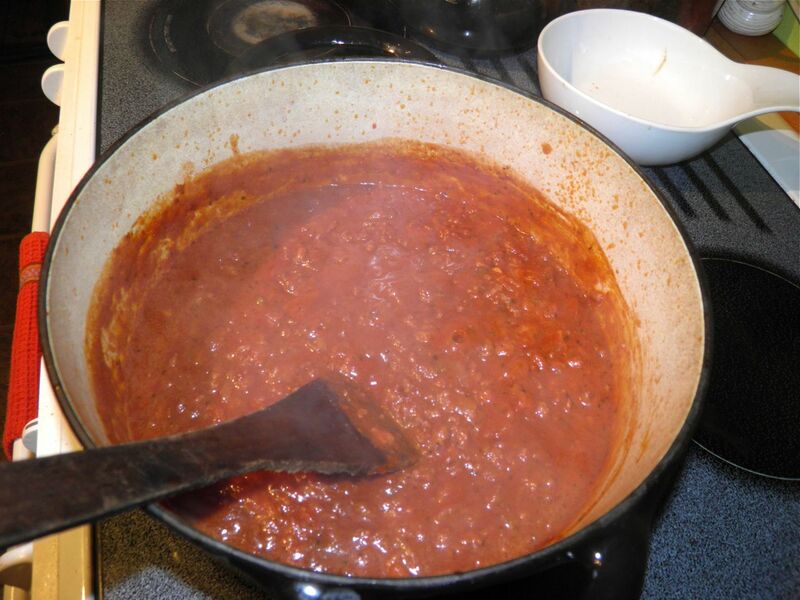 According to Marcella Hazan in "The Classic Italian Cookbook", the longer Ragù alla Bolognese cooks the better; a 5- or 6-hour simmer is not unusual. The people of Bologna traditionally serve their famous ragù with freshly made egg-pasta tagliatelle (tagliatelle alla bolognese) and their traditionally green lasagne. It should be noted that the Italians do not pair Ragù alla Bolognese with spaghetti. Wider shaped pasta are thought to hold up to the heavy sauce better. In Italy, the pasta is stirred into the sauce to gather flavour rather than served with the ragù on top, as is common elsewhere. It's not that difficult to make pasta if you want to go the extra mile. You certainly have time while the sauce is simmering. There's a tenderness in homemade pasta that you just don't find in dried, and often not in store purchased fresh (which no hands have ever touched). I hope you enjoy this sauce. It's definitely a keeper. * Soffritto is the sautéed vegetable base in ragù and other Italian dishes. enough to keep the Autumn chill at bay. Heat the olive oil in a large saucepan. Add in the onions and garlic. Cook until they begin to soften. After the onions look like they’re beginning to soften add the carrot and celery and stir to combine. Then add in the chopped bacon and cook for about 5 minutes more. After 5 minutes add the sausage meat and break it up as it cooks. Once the sausage is no longer pink, add the milk and allow it to cook until almost completely evaporated. Then stir in the red wine, tomato sauce, paste and spices. The recipe only calls for a little salt. Don’t worry. You will be checking for salt at the end of the cooking time. Reduce heat to simmer and let the mixture cook for about 2 to 2-1/2 hours. Stir it periodically to ensure it doesn’t stick to the bottom of the pan. At the end of the cooking time the sauce will be fairly dry. If necessary add some water (or a little more red wine!). Taste the sauce for salt and adjust if desired. 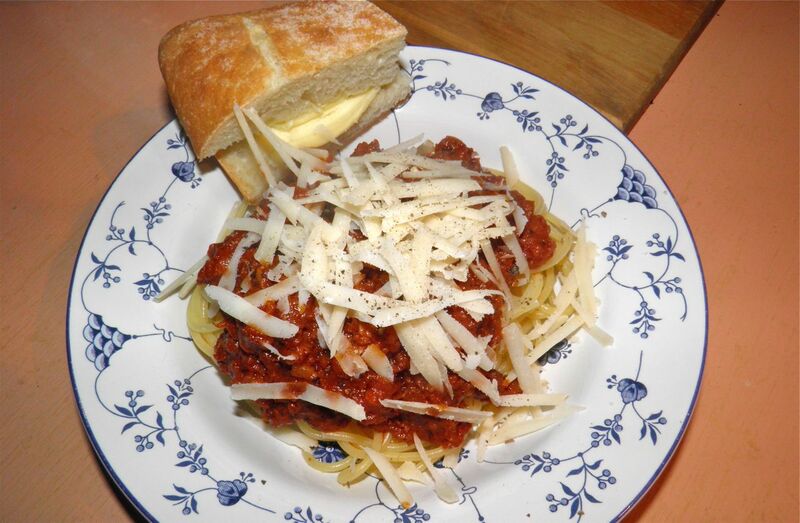 Serve on top of linguine or tagliatelle with grated parmesan. Look so yummy...Italian foods really look delicious specially when it is plated on an classical Italian porcelains. And speaking of Italian porcelain, OdartStore.com offers the best of its kind. I just discovered your site and I am so impressed with your cooking style. I couldn't imagine how someone from Nova Scotia could get their flavors all so right and then I had a 'think' about it and realized that the Cajuns came from Nova Scotia! It's the choices you make about WHAT to cook that is so ever-lovining impressive as well. I love that you write about anything you want to especially dogs- that's nice. Hi DZB, sorry it took so long to get back to you. It's kind of you to think that my recipes sound impressive. More than anything it's experience that guides my choices – and a sense of adventure. I make recipes from all cultures. It's an in-born sense of curiosity. I also research what makes a cuisine special. Once you understand, you can set off on your own paths. I'm not paid by anyone or any company so I can pretty much say what I want – including about dogs. Thanks for your comment!